All hail the noblest of knights, fairest of ladies, and even a dragon or two… live like a legend with the best of medieval times party characters in Los Angeles! Are you looking for a legendary party that even King Arthur and his medieval knights of the Round Table would have attended? If so you are in the right place. 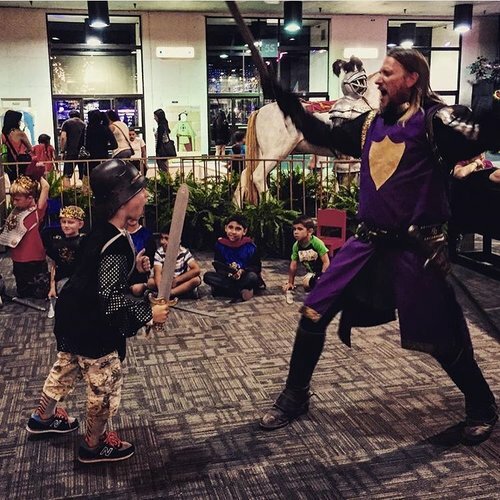 When it comes to capturing the spirit, chivalry, and adventure of the medieval times our exceptional medieval knight and fantasy staff has delighted over 100,000 children and adults for over 12 years! 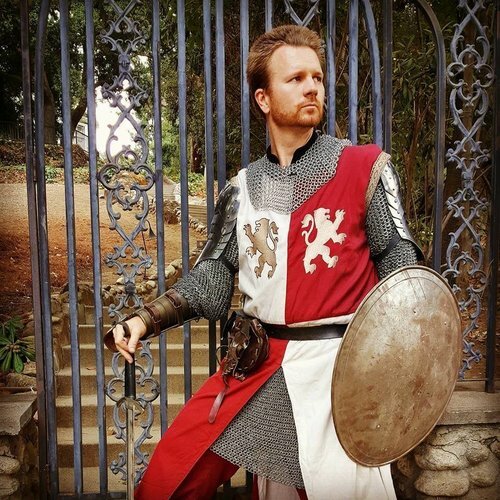 Our medieval knight and medieval fairytale themed packages feature highly honed, dynamic shows with funny and daring sword fighting knights, stunning Broadway-caliber singing princesses, and full blown archery ranges with kid-safe blunted arrows and nationally certified coaches... we can even add on a magical snow-white unicorn as an extra if desired! Please scroll down to learn more and contact us to check on availability for your next medieval knight birthday party, Renaissance Faire, or Middle Ages school assembly. Starting at $250 based on location. Features very energetic and active outdoor themed games, kid-safe sword fighting, photo time, and physical agility training relating to knightly conduct and training. Starting at $500 based on location. Features very energetic and active outdoor themed games, kid-safe sword fighting, photo time, and physical agility training relating to knightly conduct and training PLUS a choreographed mock combat sword fight between the two characters to entertain your guests. Price based on number of shows and location. A scripted, dynamic mini show including choreographed sword fighting with 2 knights where audience members become part of the action and learn how to sword fight (with foam or reinforced plastic swords) too. Knights & Princess Ready for your Event! Starting at $1000 for 1 show, additional time discounts available for multiple shows in 1 day based on location. For family-friendly audiences where a full 40 minute stage show is required. This show follows the adventures of Princess Emma on her adventure quest to reunite her knightly friends in friendship through an audience-interactive quest. This show features live singing performances, choreographed sword fights, puppetry, and concepts suitable for ages 4+. At least a 30'x20' flat cleared space with a minimum ceiling height of 10 feet, preferably with clearly marked audience boundaries to denote fighting areas for knights for the show (2+ knights). We have both male and female knights on staff and reserve the right to staff the closest prefer to you and will not honor gender requests per US anti-discrimination laws. Each performer has their own unique costume that plays this role. As a result it is not possible to request a specific costume. Armor wearing is based on temperature and time duration - real armor weighs 40-120 pounds and is physically exhausting for performers to wear over 20 minutes in length. If you are having an extended time over 20 minutes the performer reserves the right to modify their costume to reduce this weight and heat stroke risk from wearing armor in heat / direct sunlight / etc. Our party packages do NOT include the castle set in the video or other decorations / props / backdrops etc. That set was owned by one of our county fair clients and is not available for rent. Additional travel charges may apply based on location. Children's costuming and castle not included. Knight brings their own stage combat weapons and 1-2 guest-friendly (non-metal) swords for 1:1 training with the knight. Most guest fighting drills in this show are done unarmed to teach proper technique. Adaptable for wheelchair using guests and most forms of disabilities. Participation and use of training swords subject to guest's safety towards themselves and others. Adaptable as historical education - our knights have specific training and education in history and can teach about horses, life, armor, and lore of the middle ages, please let us know if your interests are more educational-based so that we can adapt accordingly. The knight training and medieval swordsmanship show is available year-round for international events and seasonal fairs and theme park entertainment contracts. Theme park and county fair day rates are available.